So I mentioned in my previous Muller review that their products just popped up out of nowhere on a trip that I had made to my grocery store. The following week, not only had they popped up out of nowhere, but they were also now being featured in a weekly ad circular as part of their debut at Kroger. Since I had good success with my first Muller product, I was more than eager to try out another Muller product, this time focusing on their Corner line with this Muller Corner Lowfat Yogurt with Blueberry. This Corner product comes in at 5.3 ounces and has 140 calories and seven grams of protein. I picked it up at the aforementioned Kroger for $1.00. This product line is called "Corner" for what should be a fairly obvious reason...the fruit component of the single serving cup is in a "Corner" compartment in the whole mold of everything. With this design (similar to that of Fage), it's kind of choose your own adventure, although the recommended adventure is that you flip up the fruit portion (the plastic is semi-perforated to show you that this is the way to go) and dump it into your plain lowfat yogurt. So, before I did that (since that is what they implied that I should do), I took a look at both the yogurt and the fruit and was impressed by both. For lowfat yogurt, I was impressed by the thickness of this Corner yogurt. The fruit mix itself had a strong blueberry smell and had some fairly decent sized blueberry chunks, which was a pleasant surprise to me. All in all, it's a pretty basic composition, so the real question is the taste. Dipping my spoon into the lowfat yogurt first, it wasn't nearly as thick as I originally thought, but it still was thicker than a typical lowfat yogurt and had a nice, cooling taste that oddly reminded me of a cheese or extremely mild sour cream. I wasn't expecting that, but I actually really liked it, so that was another nice surprise from this cup of yogurt. The blueberry mixture itself had nice, sweet blueberry flavor but did not have the tang that blueberries can sometimes have. The texture of the mixture itself was moderately thick and reminded me of a blueberry jelly or spread that you might put on your toast and once again, I was quite pleased by this. When I ended up flipping the Corner over and mixing these together, my pleasure continued as the yogurt and blueberry mixed perfectly together to provide a semi-sweet and cooling treat. Neither flavor particularly stood out as being better or more prominent than the other, but they both worked well hand-in-hand and also made sure that you knew that they were separate flavors. Buy It or Fly By It? This is a Corner that I wouldn't mind visiting again and neither should you, so it gets a BUY IT rating. I've been pleased with these Muller products so far and since I bought a truckload of them when they were being introduced at Kroger, you are going to see more of these reviews as time goes on. 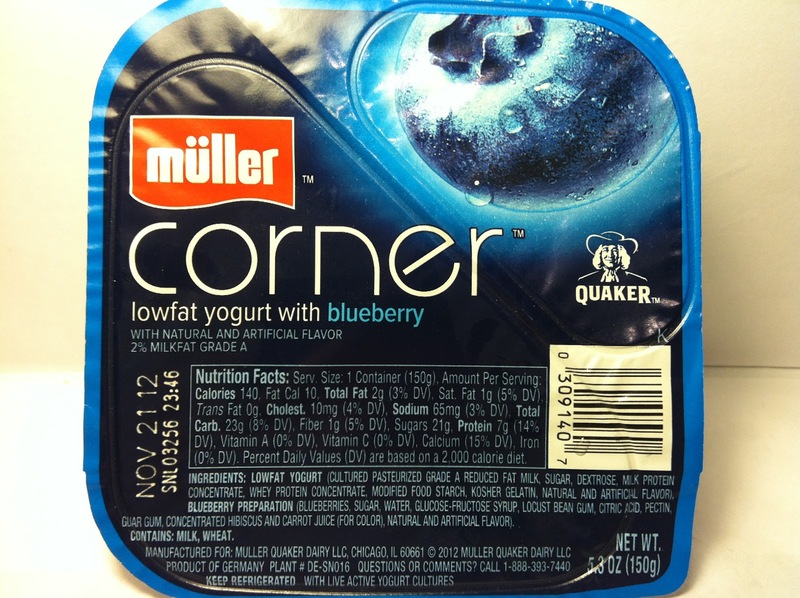 I've been wondering when one of the Muller Corner's would make an appearance on here. I had pretty much the same experience as you at being somewhat surprised to see this entire new brand of yogurts at my local Kroger (in Illinois). I have been pretty impressed so far with the ones that I've tried. I have a question though for you, am I weird since I like eating my yogurts not mixed in? I eat this style of yogurt with the fruit dumped on the yogurt but I don't mix it in. I like having the contrasting flavors between the different layers. This is even more true with the Muller "fruit mousse" yogurt that you tried a while back. I figure that if a company goes through the trouble of putting things in layers (or in a separate cup) then it is intended to be without mixing. I don't think not mixing them makes you weird at all as it's just a matter of personal preference. Personally, as you've seen by my reviews, I prefer mixing things, but to each their own. 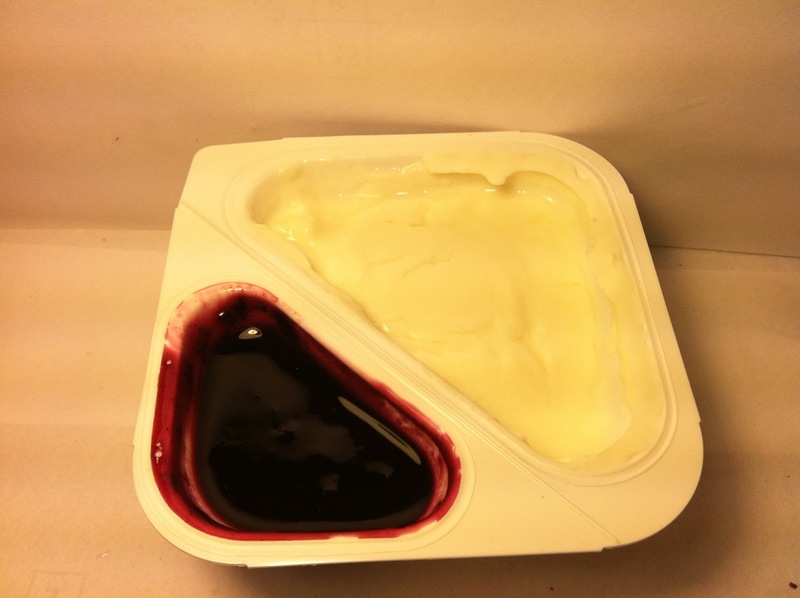 That said, I do think these Corner products were designed with the intent that the consumer would mix them as they've set up the container with the bendable design so that you'll dump one portion into the other. FYI, there will be a lot more Muller reviews this week, so keep your eyes peeled! Just read in Forbes yesterday that you are going to see a big push of it now that PepsiCo/Quaker has gotten really behind it, so be ready. Also, be ready for more reviews of it here, because I've got about five of them stocked up in queue!